Quatrophonic Music: The home of immortal music! BREAKING NEWS! MICHAEL QUATRO'S GREATEST HITS HAS BEEN RELEASED! MICHAEL'S Paiintings, Look Deeply Into The Mirror, and Dancers, Romancers HAVE BEEN RELEASED!! THE CLASSIC CRUISE MANIA SOUNDTRACK CD FEATURING MUCH OF MICHAEL'S MUSIC HAS BEEN RELEASED!!! Produced by Michael Quatro, Executive Producer for the remastered series is Ron Sandler. Producer of the Classic Cruisemania movie: Michael Kowal. The Quatrophonic Entertainment Corporation, its affiliates, friends and its labels, QT Records and Quatro Records and Quatrophonic Music welcome you! Michael Quatro, Artistic Director and Ronald (Ron) Sandler, Chief Executive Officer and a dedicated staff including Michael Kowal (A & R and Film/Video Production), Abby Schwartz (Special Projects) and Glen Dzdidowski (shareholder relations) are here to help you. We produce several CD products, videos and a variety of entertainment items. Music and hit songs are our life and we are in the business of creating hit records maybe with your song! If you have a song or a CD, maybe we can help make it a hit. Our roster of talented hit artists in the jazz, alternative, hip hop, punk, rock and ethereal soul / rock genres will take your breath away. We all hope you enjoy your tour of our site, soon loaded with a CD of each of our artists. But we are more, with products that honor America and celebrate America's role in the exploration and exploitation of Space - The Final Frontier. If you are an investor or seek to enter into a contract with us, Please visit our corporate page. Thank You. Corporate Contract Information has been moved to the corporate page. Please follow the corporate page link above before signing a contract with us! CLICK ON THE NEWS ICON NOW!!! or click on the store link in the graphic above. Copyright © 1999, 2003, 2004, 2005, 2006 Quatrophonic Music Corporation and the Quatrophonic Entertainment Group of rock, jazz alternative and other companies. The Quatro Logo and any alternative shading thereof, and any proper naming using Quatro or Quatrophonic are trademarks or service marks of QMC. 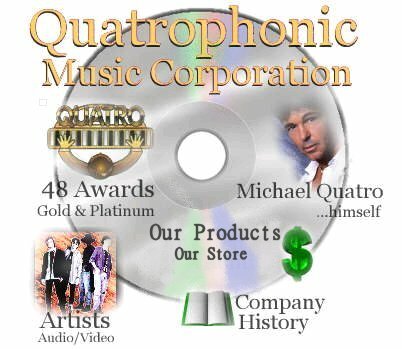 The following are also trademarks and service marks of QMC: Quatro Records, QT Records, 4Q Records, Q Music Publishing, Quatrosongs, Q Films, Q Realty. Last modified: November 11, 2002; March 2003; July 24, 2003 August 10, 3003 added reference to investor alert. September 22, 2003. Revised to indicate no stock sales ongoing and note about MAQ on 21 Jan 2004. Image Map modified, Investor Alert Page added and Quatro Sales link added on May 20, 2004.Previous Investor Alert Page Archived on March 8, 2004.